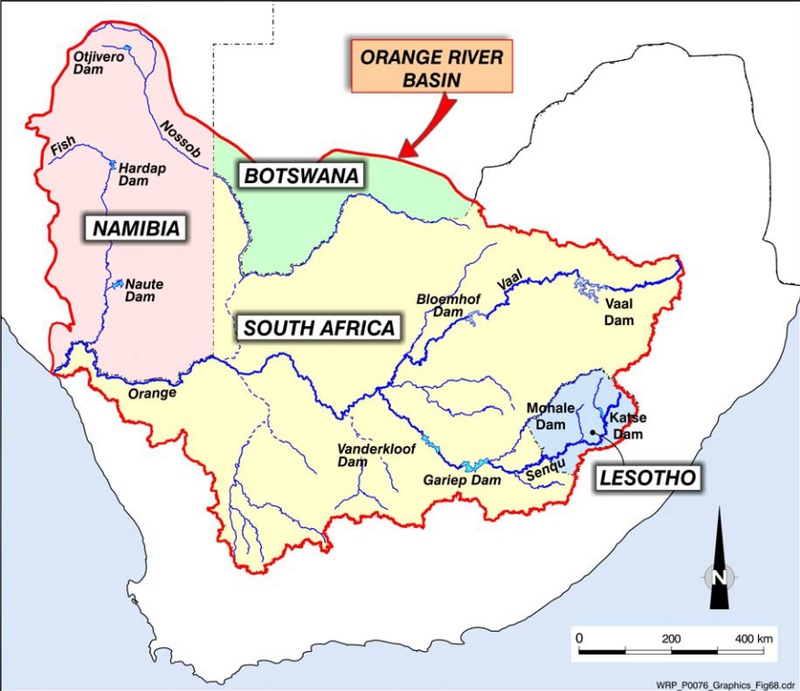 The whole of Lesotho falls into the Orange-Senqu River basin along with parts of South Africa, Botswana and Namibia (Figure 1) (World Bank 2016; International Rivers 2005). All of Lesotho’s rivers ultimately drain into the Orange River in South Africa and (eventually) into the Atlantic Ocean (World Bank 2016; International Rivers 2005). While Lesotho only covers about 5% of the Orange-Senqu River Basin’s surface area, is a critically important part of the Basin because it accounts for approximately 40% of the total annual runoff (the water flowing in the rivers) (World Bank 2016). in light blue – contribute more than 10% to the water supply. Lesotho has two major dams, the Katse Dam on the Malibamatso River (which is the second biggest dam in Africa) and the Mohale Dam on the Senqunyane River (Lesotho Bureau of Statistics 2014; International Rivers 2005). Additionally, Lesotho has several smaller dams (such as the Thaba Phatsoe, Metolong and Sebaboleng Dams) and there is one major dam (the Polihali Dam, downstream of the confluence of the Khubelu and Senqu Rivers) currently being developed as part of Phase II of the Lesotho Highlands Water Project (Morgan-Jarvis 2018; World Bank 2016). Both the Katse and Mohale Dams are part of the Lesotho Highlands Water Project (LHWP), through which Lesotho annually transfers approximately 780 million cubic metres of water to South Africa (LHDA 2018). The LHWP has made selling water Lesotho’s biggest source of foreign exchange (International Rivers 2005). Since 1998, the LHWP has earned nearly nine billion Maloti (LHDA 2018). Furthermore, the money earned from these water sales has been calculated to account for about 10% of Lesotho’s national budget (World Bank 2016). Not only does the LHWP allow Lesotho to export water to South Africa, the LHWP also generates hydroelectric power, which is the main source of Lesotho’s electricity (LHDA 2018). In spite of these benefits, the LHWP has had large, negative socio-economic impacts on many people in Lesotho who were affected by the building of the LHWP (Thamae and Pottinger 2006; Hoover 2001). In a report from 1999, entitled Contract LHDA 648 Final Report: Consulting Services for the Establishment and Monitoring of the Instream Flow Requirements for River Courses Downstream of LHWP Dams, it was reported that If the all the phase of the LHWP are implemented in full (the building of five major dams in total – two already exist), the social and environmental impacts (upstream and, especially, downstream) would be “critically severe” (Hoover 2001; Thamae and Pottinger 2006). The river condition of rivers within Lesotho is mixed, which means that while some rivers are able to contribute towards river ecosystem biodiversity targets others are not (SANBI 2011). River systems are divided into sections and the health of each section is graded into one of several categories (SANBI 2011). These categories are listed in Text Box 1. Rivers that are unmodified or in their natural state are able to contribute towards river ecosystems biodiversity targets (SANBI 2011). In contrast, rivers that are categorised as ‘largely modified’ or worse are unable to contribute towards river ecosystems as they are not in a good state. 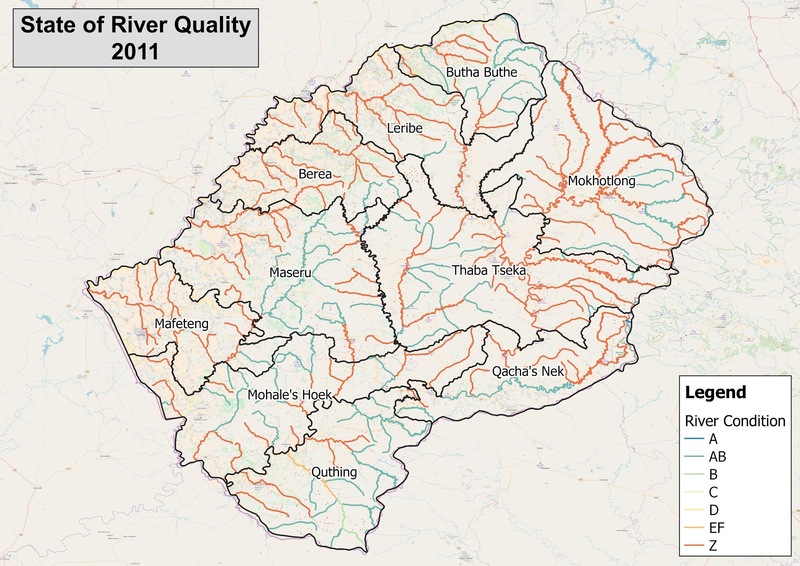 Many rivers in Lesotho (Figure 2) are classified as AB (‘A or B above’) in the tributaries and upstream sections of the rivers and Z (‘tributary condition modelled as not intact, according to natural land cover’) in the lower reaches of the main rivers. Examples of such rivers include the Makhaleng, Senqunyane, Mokhotlong, Malibamat’so and Bokong Rivers (SANBI 2011). Furthermore, the Malibamatso and Matsoku Rivers have been classified as AB, while the Senqu River has been classified as Z (SANBI 2011). Additionally, the Caledon River, which makes up most of Lesotho’s north-western border with South Africa, is classified as D (‘largely modified’) (SANBI 2011). In Lesotho, access to safe drinking water and sanitation are developmental challenges. It is estimated that approximately 25% of people in Lesotho do not have access to safe drinking water and approximately 75% lack access to adequate sanitation services (Doran 2017). For the 2011/2012 period, it was estimated that on average 4.3% of households in Lesotho had drinking water piped into their houses from water schemes, while a further 27.45 oh households had water piped to their plot (Table 1) (Lesotho Bureau of Statistics 2014). A further 8.8% of households relied on water piped to someone else’s plot, while 31.8% of households relied on community standpipes for their drinking water (Table 1) (Lesotho Bureau of Statistics 2014). In addition to drinking water, sanitation levels are higher in urban areas than in rural areas. In urban areas in 2011, an estimated 47% of households use ‘VIP’ toilets, 35% use pit latrines and 9% have no toilet facilities (Table 2) (Lesotho Bureau of Statistics 2013). By comparison, in rural areas in 2011, an estimated 18% of households use ‘VIP’ toilets, 30% use pit latrines and 50% have no toilet facilities (Table 2) (Lesotho Bureau of Statistics 2013). These levels of sanitation, especially the high percentage of households with no toilet facilities in the rural areas, negatively affect water quality in Lesotho and often result in water contamination and increases in water-borne diseases such as diarrheal diseases, dysentery, typhoid fever, cholera and the spread of the E. Coli bacteria (Doran 2017; Jacobs 2017; P Gwimbi 2011; WHO 2016). Given the high levels of HIV/AIDS and poverty in Lesotho, lack of adequate water and sanitation is detrimental to the development of Lesotho and the health of its people (World Bank 2016; Doran 2017; Mofelehetsi 2005; Mekbib et al. 2017; Ministry of Local Government and Chieftainship Affairs 2015). Water resources in any catchment are largely dependent on rainfall. The Historical Climate Monthly Averages include long-term historical monthly average rainfall totals and monthly averaged minimum and maximum temperatures for a particular area (AfriGIS and Climate System Analysis Group 2018b). The Historical Climate Monthly Averages for the Mohale’s Hoek District area have been calculated using the nearest weather data station, which is the measuring station near the town of Mohale’s Hoek (Figure 3). The graph (in Figure 3) shows that average temperatures peak in the same months as highest rainfall, indicating that the Mohale’s Hoek District is in a summer rainfall area (AfriGIS and Climate System Analysis Group 2018b). Resultantly, there is less rainfall during the winter season with the lowest average monthly rainfall historically occurring in July, which averages less than 12 mm (AfriGIS and Climate System Analysis Group 2018b). Climate change is predicted to have an impact on rainfall patterns and temperatures in Lesotho (Mekbib et al. 2017; World Bank 2016; Patrick Gwimbi et al. 2013). The average total rainfall is predicted to decrease slightly, however, rainfall variability is predicted to increase both temporally (i.e. over time, for example, seasonal changes) and spatially (some areas will get more rain than others) (World Bank 2016; Patrick Gwimbi et al. 2013, 4). Average temperatures are predicted to increase in Lesotho and this is linked to higher levels of evaporation (World Bank 2016). Additionally, frequency and intensity of climate-related hazards such as floods and droughts are predicted to increase (World Bank 2016; Patrick Gwimbi et al. 2013; CIAT and World Bank 2018; Mekbib et al. 2017). In the future, water stress and water scarcity may grow, leading to “diminishing capacity to meet the future growth in demand for domestic and industrial water in Lesotho” (World Bank 2016; Patrick Gwimbi et al. 2013). Future rainfall projections for the Mohale’s Hoek District (using the measuring station near the town of Mohale’s Hoek) for the period 2020 to 2040 (Figure 4) are made using the Representative Concentration Pathways (RCP) 4.5 greenhouse gas concentration trajectories (AfriGIS and Climate System Analysis Group 2018a). The bar charts (Figure 4) show the potential change in rainfall, with the blue bars indicating a potential increase in average rainfall and the red bars indicate a potential decrease in average rainfall (AfriGIS and Climate System Analysis Group 2018a). The grey lines represent the various models used for this projection. It is, therefore, projected across most of the models that Mohale’s Hoek District area could experience an increase in rainfall in the months of March, April, August, September, October and December, and a decrease in rainfall during January, February, June, May, June, July and November (AfriGIS and Climate System Analysis Group 2018a). Water quality in the Mohale’s Hoek District is degraded by pollution. In the Mohale’s Hoek District in 2011, an estimated 0.36% of households had their refuse regularly collected, while a further 1.21% of households had their refuse irregularly collected (Lesotho Bureau of Statistics 2013). This is a lot lower than the estimated national average for households that had their refuse regularly collected, which was 3.27% in 2011 (Lesotho Bureau of Statistics 2013). The national average for households that had their refuse irregularly collected was 0.94% in 2011 (Lesotho Bureau of Statistics 2013). These very low levels of regular refuse collection mean that often uncollected waste ends up in water and sanitation infrastructure, blocking stormwater drains and polluting rivers. These issues lead to decreased water quality and increased risks associated with flooding, especially in and around urban areas. AfriGIS, and Climate System Analysis Group. 2018a. ‘Future Climate Projections – Mohale’s Hoek’. http://cip.csag.uct.ac.za/webclient2/datasets/africa-merged-cmip5/#nodes/cmip5-anomalies?folder_id=33&extent=105744. ———. 2018b. ‘Historical Climate Monthly Averages – Mohale’s Hoek’. http://cip.csag.uct.ac.za/webclient2/datasets/africa-merged-cmip5/#nodes/seasonality-cmip5?folder_id=33&extent=105744. CIAT, and World Bank. 2018. ‘Climate-Smart Agriculture in Lesotho’. Washington, D.C., USA: World Bank. http://documents.worldbank.org/curated/en/866541527750717859/Climate-smart-agriculture-in-Lesotho. CSIR. 2013. 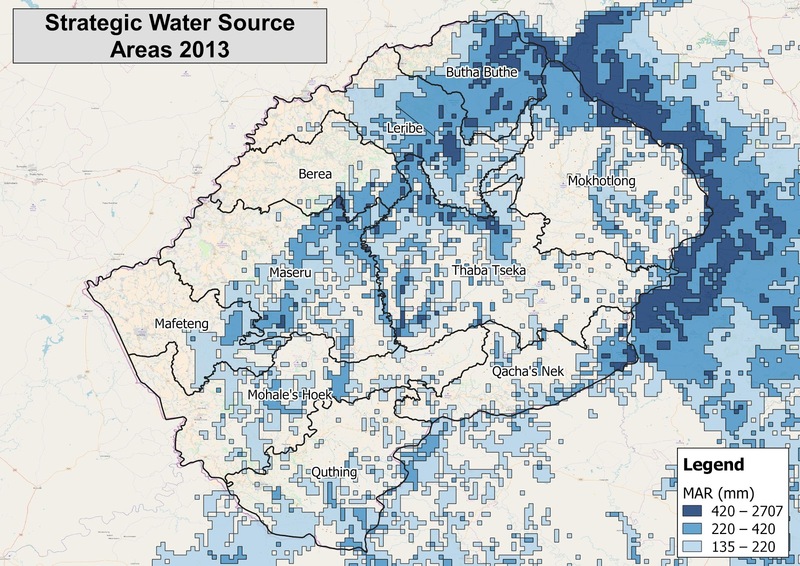 ‘Strategic Water Source Areas 2013 [Vector Geospatial Dataset]’. South African National Biodiversity Institute. http://bgis.sanbi.org/SpatialDataset/Detail/504. Doran, Gabrielle. 2017. ‘Water and Sanitation in Lesotho Delays Poverty Reduction’. The Borgen Project (blog). 17 August 2017. https://borgenproject.org/water-and-sanitation-in-lesotho/. Gwimbi, P. 2011. ‘The Microbial Quality of Drinking Water in Manonyane Community: Maseru District (Lesotho)’. African Health Sciences 11 (3): 474–80. Gwimbi, Patrick, Timothy S. Thomas, Sepo Hachigonta, and Lindiwe Majele Sibanda, eds. 2013. ‘Chapter 4 – Lesotho’. In Southern African Agriculture and Climate Change: A Comprehensive Analysis. Washington, DC: International Food Policy Research Institute. http://dx.doi.org/10.2499/9780896292086. Hoover, Ryan. 2001. ‘Pipe Dreams: The World Bank’s Failed Efforts to Restore Lives and Livelihoods of Dam-Affected People in Lesotho’. Berkeley, CA, USA: International Rivers Network. https://www.internationalrivers.org/sites/default/files/attached-files/download_a_2001_report.pdf. International Rivers. 2005. ‘A Brief History of Africa’s Largest Water Project’. International Rivers. January 2005. https://www.internationalrivers.org/resources/a-brief-history-of-africa%E2%80%99s-largest-water-project-3664. Jacobs, Helena. 2017. ‘Top Diseases in Lesotho – a Small Landlocked Country in Southern Africa’. The Borgen Project (blog). 16 February 2017. https://borgenproject.org/top-diseases-in-lesotho/. Lesotho Bureau of Statistics. 2013. ‘2012 Solid Waste, Water and Sanitation Report’. Statistical Report 19. Maseru, Lesotho: Lesotho Bureau of Statistics. http://www.bos.gov.ls/new%20folder/Environment%20and%20Energy/2012_Solid_Waste_Water_and_Sanitation.pdf. ———. 2014. ‘2013 Solid Waste, Water and Sanitation Report’. Statistical Report 15. Maseru, Lesotho: Lesotho Bureau of Statistics. http://www.bos.gov.ls/New%20Folder/Environment%20and%20Energy/2013_Solid_Waste_Water_and_Sanitation.zip. LHDA. 2018. ‘Water Sales’. Maseru, Lesotho: Lesotho Higlands Development Authority. http://www.lhda.org.ls/Phase1/Reports/PDF/June%202018/Water%20Sales.pdf. Mare, H. 2007. ‘Review of Surface Hydrology in the Orange River Catchment’. Orange River Integrated Water Resources Management Plan. http://www.orangesenqurak.com/UserFiles/File/Other/Water%20Resources%20Management%20Plan%20Study/Surface%20hydrology.pdf. Mekbib, S.B., A.O. Olaleye, M. Johane, and T. Wondimu. 2017. ‘Chapter 8 – Indigenous Knowledge to Address the Challenges of Climate Change: Case of Machobane Farming System in Lesotho’. In Indigenous Knowledge Systems And Climate Change Management In Africa, 316. Wageningen, The Netherlands: The Technical Centre for Agricultural and Rural Cooperation. https://publications.cta.int/media/publications/downloads/2009_PDF.pdf. Ministry of Local Government and Chieftainship Affairs. 2015. ‘The Kingdom of Lesotho: Habitat III National Report 2015’. http://habitat3.org/wp-content/uploads/Lesotho-Habitat-III-Report-08-June-2015.pdf. Mofelehetsi, Sepolo. 2005. ‘Lack of Clean Water Still a Major Challenge for Lesotho – IFRC’. International Federation of Red Cross and Red Crescent Societies. 27 April 2005. http://www.ifrc.org/en/news-and-media/news-stories/africa/lesotho/lack-of-clean-water-still-a-major-challenge-for-lesotho/. Morgan-Jarvis, Louella, ed. 2018. ‘Water & Energy’. In Lesotho Review – An Overview of the Kingdom of Lesotho’s Economy – 2018 Edition, 2018th ed. Umdloti Beach, KZN, South Africa: Wade Publications. http://www.lesothoreview.com/digital-edition/. SANBI. 2011. ‘Freshwater Ecosystem Priority Areas (FEPAs) for River Ecosystems [Vector Geospatial Dataset]’. South African National Biodiversity Institute. Thamae, Mabusetsa Lenka, and Lori Pottinger, eds. 2006. On the Wrong Side of Development: Lessons Learned from the Lesotho Highlands Water Project. Maseru, Lesotho: Transformation Resource Centre. https://www.internationalrivers.org/sites/default/files/attached-files/wrongside2006.pdf. WHO. 2016. ‘El Niño and Health: Lesotho Overview – January 2016’. INFORM Index (Index for Risk Management) 77. World Health Organization. http://www.who.int/hac/crises/el-nino/who_el_nino_and_health_global_report_lesotho_21jan2016.pdf. World Bank. 2016. ‘Lesotho Water Security and Climate Change Assessment’. Washington, D.C., USA: World Bank. http://documents.worldbank.org/curated/en/446521472206603986/Lesotho-water-security-and-climate-change-assessment.